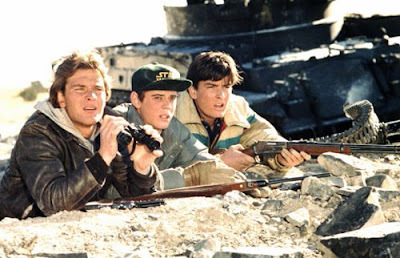 25 years later, with the Cold War long over, Red Dawn remains bleak and grimy. The famous "Wolverines!!" battle cry belies the agony the teenagers endure when they are forced to hide in the Rocky Mountains and become guerrilla rebels named after their high school football team. Each member of the Wolverines is thinly sketched with little character development outside of basic traits to crudely identify each character. (Patrick Swayze is the leader, Charlie Sheen is the hothead, Lea Thompson and Jennifer Grey are girls, etc.) The most interesting person in the movie is the Cuban general who lead the initial invasion, bristled in his role as a policeman for their occupied Colorado town, and came to identify and respect the Wolverines as rebels fighting for their homes. Most of the memorable stuff happens in the first half, including C. Thomas Howell drinking the blood of a deer. The second half of Red Dawn sees the Wolverines growing more and more desperate and doomed despite their early successes in guerrilla warfare. The tragic events of the third act seem logical and inevitable but leave a mostly unsatisfying impression.